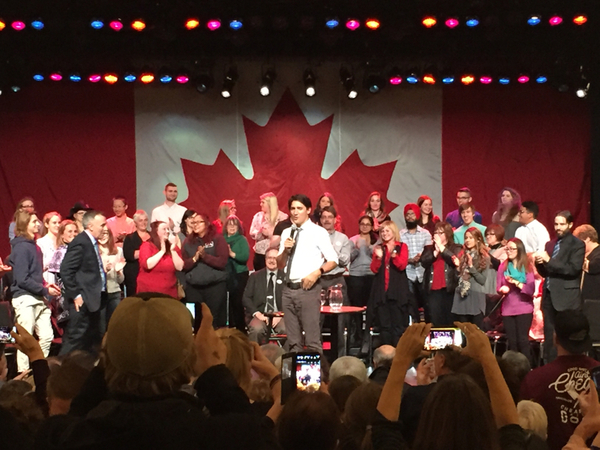 BELLEVILLE – Prime Minister Justin Trudeau answered questions about mental-health issues, immigration, national security, the environment and protecting agriculture during a town hall session at the Empire Theatre Thursday. The theatre was filled to capacity for the event. The visit, part of Trudeau’s cross-Canada tour beginning with an east-to-west trip along Highway 401, followed stops earlier Thursday in Kingston and Napanee. After his appearance at the Empire Theatre, Trudeau was to attend an honour guard at Canadian Forces Base Trenton. He was to spend the night at the base before continuing to his next stop, in Northumberland County, on Friday morning. A team from QNet News was at the Empire Theatre and covered the event live.